When Clint and I first got married we drove up to the mountains each year and cut down our own Christmas tree. Now I know that sounds super traditional and full of great memories. To be honest it was full of memories, not sure all of them were all that great. First off, we didn’t own a vehicle that was very good at driving in the mountains. Clint had a truck, but I think it was just a truck by name because when it came to hills, it was great going down hills, but going up was an entirely different matter. In fact one year we actually left the truck at the bottom of the hill and road up with some friends that drove by and saw us stuck on the hill. Secondly it was usually beyond cold. Not just a little bit cold, but can’t-feel-any-part-of-my-body-and-it-took-3-days-to-thaw-cold. Thirdly, trees in the middle of the forest look beautiful. However something happened between the time we cut it down and got it back to our little condo. At least 75% of the branches disappeared and it made Charlie Brown’s tree look like the tree that goes up in Rockefeller Center each year. Luckily being newly married and dirt poor we only had a couple of ornaments to hang on the 3 branches anyway. Of course there was the whole issue of getting the tree to stay up in the tree stand. I can’t tell you how many trees we had fall over. Well, actually I can, this will be our 9th Christmas together and so I think we’ve had 8 trees fall over. The last couple of years we decided instead of cutting down our own tree we would cheat and go to a tree stand and walk the aisles and pick one out. We have a big great room in our house now instead of the low ceiling that was in our little condo. And so I’ve always wanted a big tree. The problem we’ve found the last couple of years is that if they are big and tall, they are also big and round and so getting them inside has been a bit of an issue. Did you know that despite their appearance sliding doors aren’t all that wide, or at least as wide as large Christmas Trees? There may have been some lost branches and almost broken doors the last few years. This year after picking out a big tree we noticed that they had netting to tie the tree up in to help make the transport easier. 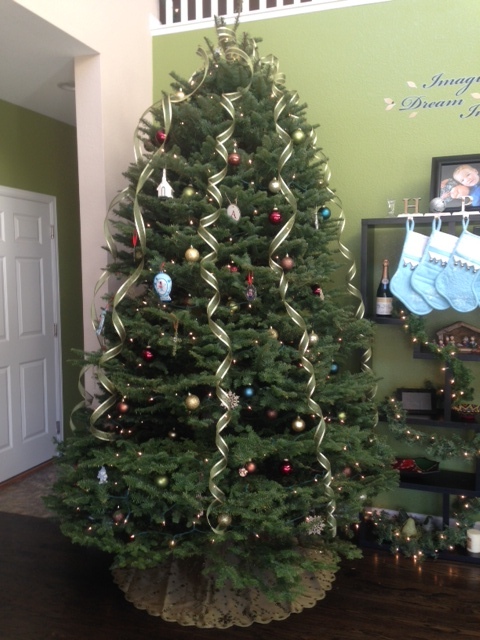 We had the stand owners wrap our tree up and then as Leighton said “just tossed it in the back of the van”. 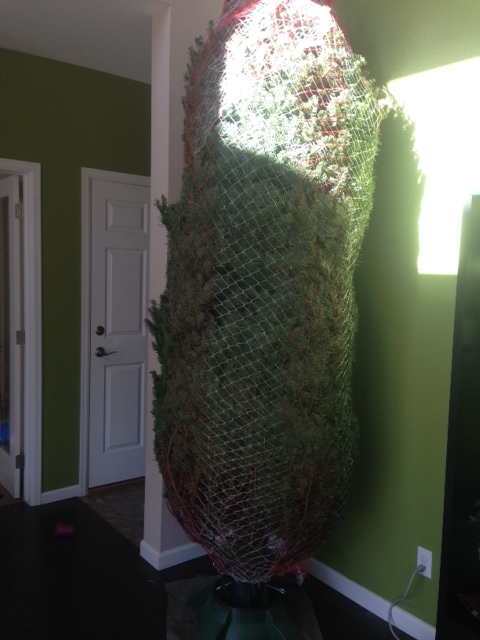 Trust me, if you have ever move a 10 foot+ tree, one does not just “toss it”. But we managed to get it secured and in the van. Clint had the bright idea of leaving the netting on and bringing the tree in the house that way. It was a brilliant idea. He was even able to set it up in the stand and get it secured before removing the netting. Granted it looked a little funny, but at least it was up! And a few short hours later it was decorated. (and hasn’t fallen over yet!) Merry Christmas everyone!